"This goes great on salads as well as chicken wings, especially the hot and spicy ones." Wisk together the mayonnaise, sour cream, buttermilk, hot sauce, garlic powder, Worcestershire sauce, parmesan cheese and parsley flakes. Add blue cheese, mix and refrigerate until chilled. This is a very tasty dressing. We tried it on not only a chef salad but Buffalo Wings, as well. The family loved it! While better than some homemade dressings, this is really unimpressive. Increasing the blue cheese didn't help either. Sorry, I won't be making this one again. Terrific! I used light mayo and reduced-fat sour cream and still got great results. I'm a blue cheese fanatic, so I doubled the amount of blue cheese. my husband is very picky and he loved this dressing!! 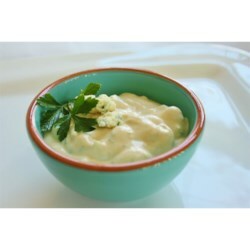 I love blue cheese dressing and this is the best! I won't be going back to the bottled kind. Thanks for sharing Linda!